Many tourists complain about Kathmandu’s dust problem, hence the cities nickname “Dustmandu” But lets look at it another way … Do you know whats special about Kathmandu? Its Dirt! Once upon a time the Kathmandu Valley was a lake, when the lake was drained, people moved here due to the rich fertility of the Dirt! Good dirt does not just grow good produce … It also makes AWESOME MOUNTAIN BIKING TRAILS. The Valley has a south side made up of red clay which, admittedly in the monsoon is a slip and slide mess, but in the dry season it makes for fast, compact trails that are easy to maintain. The North side is made up of gravel and coarse sand which makes it ride-able pretty much all year round, if at times slightly moist. Himalayan Single Track has many different rides to offer and some very special local experiences on mountain bikes. So if you have a day to spare, come along and try one of them. The aptly named Scar Route which gets its name from the overgrowth which grabs on to your arms leaving scratches and scars a your memento of mountain biking in Nepal is a beautiful single track with amazing views high up on the Valley Rim. 30 Mins of Heaven is just that … an awesome flow trail inside the jungle that you don’t want to end. 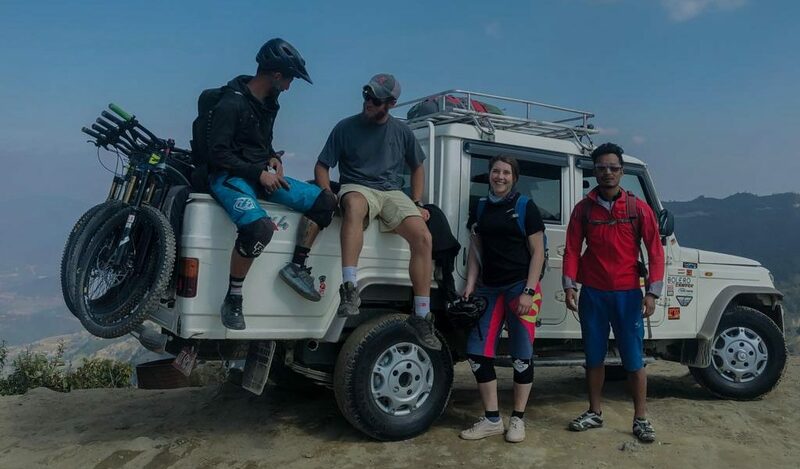 Heli Pad is one of the most famous ridge line single track descents inside the Kathmandu Valley and can be the finishing point of any ride inside the Shivapuri National Park. Kathmandu has a cable car. Chandighiri which has some awesome single track options for lovers of Enduro. Nagarkot, a hill station just an hours drive from the city has a network of trails that will please all level of Enduro rider. If you love Cross Country and uphill challenges, we have you covered as well. With many 600m to 1000m climbs on offer to any of the hill tops surrounding the valley. Are you a cyclist but not a mountain biker? Then let us know, our guides are really good at teaching skills and helping you learn while you ride. Our team of guides love to help you with your skills. BUT, Be careful mountain biking is addictive (and costly 😉 ) once you try you may never go back to normal cycling! BEER – Is easier to find than water in most villages you ride through, and CHEAP. VIEWS – The horizon is filled with views of the snow capped Himalaya .. defiantly the highest mountains in the world. PEOPLE – Kathmandu has a fast growing local MTB scene and no matter where you ride, you can bump into some friendly locals who are always happy to meet new riders. BLOOD DONATION – During rides in the monsoon ONLY. (Leeches .. thanks for supporting our wildlife).